Brace yourselves, PC gaming stalwarts: Valve's has announced its digital distribution service and first-party library of games are coming to the Mac this April. Hear that? It's the sound of millions of PC gamers crying out in agony as the last bastion of PC elitism finally succumbs to Steve Jobs' reality distortion field, and mil- err, thousands of Mac gamers breathing a collective sigh of relief at no longer having to boot into Windows to play TF2. OK, maybe it's not that dramatic. But it's hard to understate how huge a development this is for Mac users who have wanted to game on their machines but were severely limited by the number of titles available to them. 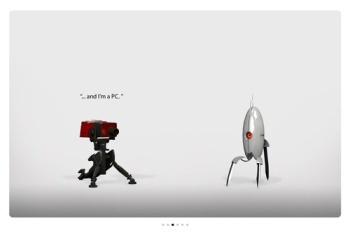 And while only Valve titles, including Left 4 Dead 2, Team Fortress 2, Counter-Strike, Portal and the Half-Life series, will be available when the Mac Steam client is released next month, third-party titles will undoubtedly follow suit. Mac gamers will be heartened to hear that this isn't a side project for the Bellevue, Washington, developer, either. Not only will the Mac version of Steam run games in OSX natively, rather than via emulation, but they will adhere to the same release schedule as well, starting with the upcoming Portal 2. "We are treating the Mac as a tier-1 platform so all of our future games will release simultaneously on Windows, Mac, and the Xbox 360," said Director of Steam Development John Cook. "Updates for the Mac will be available simultaneously with the Windows updates. Furthermore, Mac and Windows players will be part of the same multiplayer universe, sharing servers, lobbies, and so forth." As a regular user of both Macs and PCs, this is fantastic news. Good riddance, Boot Camp partition. And three cheers to Valve for bringing gaming to a younger, hipper and better dressed audience!